From My Brown Eyed View : Blog Blast 4 Peace 2013 Dona Nobis Pacem! 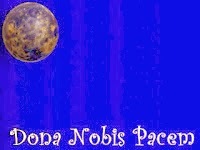 Blog Blast 4 Peace 2013 Dona Nobis Pacem! Please send to me the spirit of Your peace. Then send, dear Lord, the spirit of peace from me to all the world. Amen. Today is Blog Blast for Peace. Thousands of bloggers are sending the same message out in our individual ways. My hope and prayer for everyone is very simple. That everybody on Earth know what it is like to live in a peaceful world. I know that there are people who will declare that this will never occur. However, I believe that we should never ever stop working towards achieving peace. Please take time to visit The Official Site of Blog4Peace to learn more about this annual day and the goals for global peace. I'm going to Blog for Peace. Will You?